To navigate R3's web site, look at the tabs to the left. 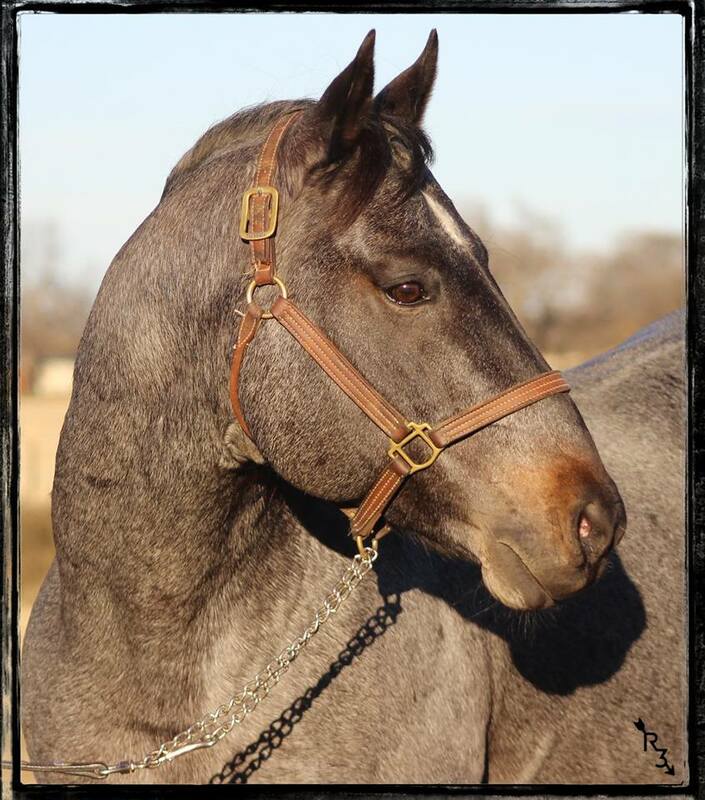 The one that reads SWISHER HANCOCK has all his information regarding the services we offer for AI'ing to our senior STALLION and sire to all foals offered for sale. The tab that reads, OUR MARES shows you each individual mare in our program and their bloodline percentages along with pedigree. The tab that reads OUR GELDINGS shows you the 3 SWISHER sons we held back to show and their ongoing accomplishments. The tab that reads SWISHERS GET shows many of his OFFSPRING from the time we purchased him and from the time prior when L4 owned him. You will find a SALES BARN tab for what we currently have for sale and several SOLD BARN tabs to show our past sales. Our SIGN FOAL LIST tab explains what it takes to reserve your R3 UNICORN in great detail. You may find our REFERENCE SIRES tab useful as it shows many of the great STALLIONS that make up our BV/JH program! We here at R3 get asked all the time how our foals/weanlings look so healthy. We took a reproductive class at TSU in the Spring of 2016 and Tennessee is currently a college student getting updated information in her major which is, Animal Reproduction. 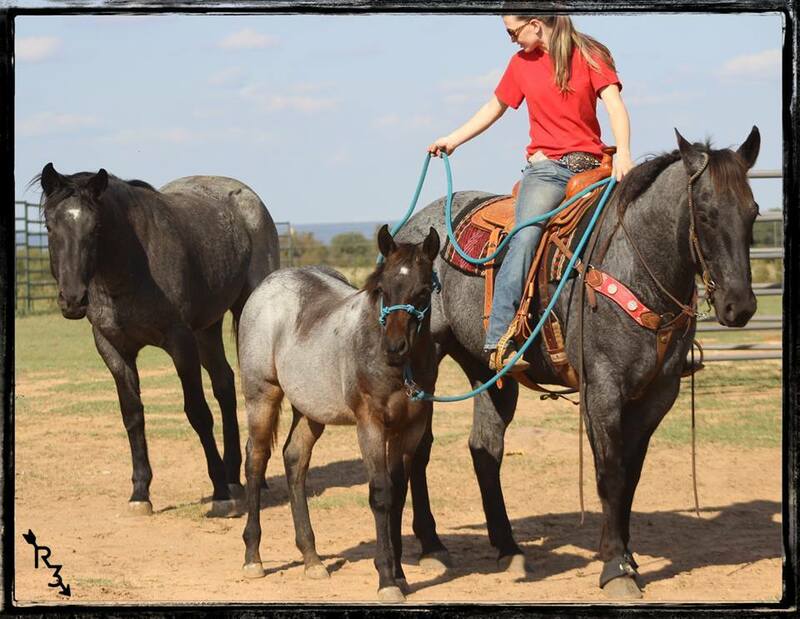 (Update: Graduated Fall of 2017, currently working at Weatherford Equine Repro Center). What we learned from taking that class just re-enforced what we had already been doing. Reproductive characteristics are about 95% caused by environmental factors, 5% or less is genetic". Layman terms, just because one stud is a good producer doesn't mean his offspring will be. It is based on their environment and will be different in a wide variety of programs. The environment will affect maturation, scrotal size, health, etc..
R3's mares are brought up in the evenings and fed well, again in the morning then pastured during the day. 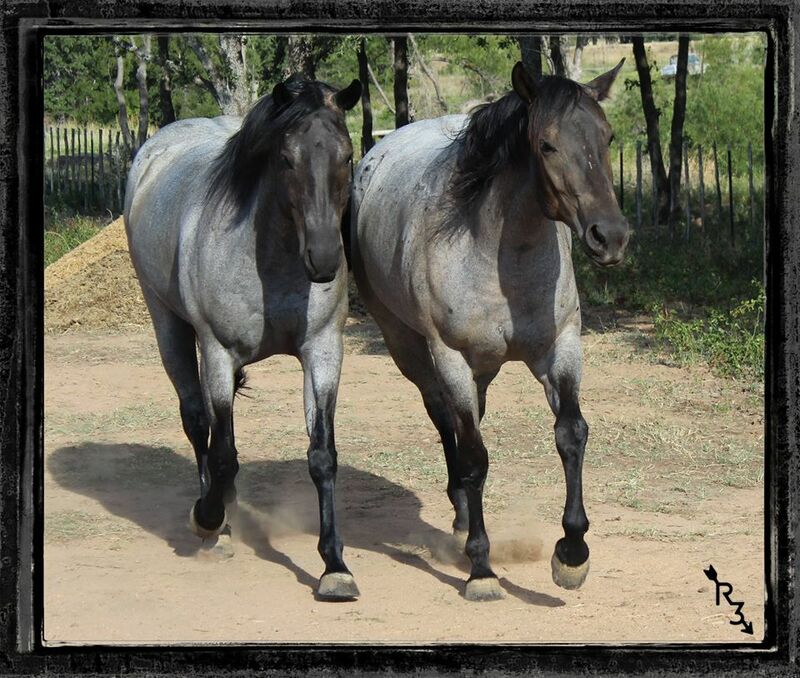 We are constantly body scoring each mare and adjusting their feed on an individual level. 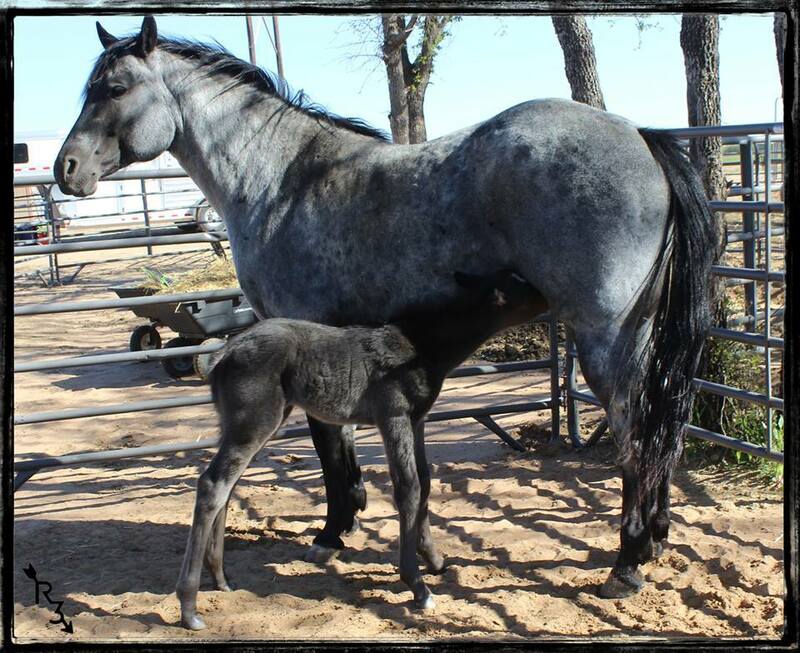 A healthy, well developed foal/weanling starts with their dam. 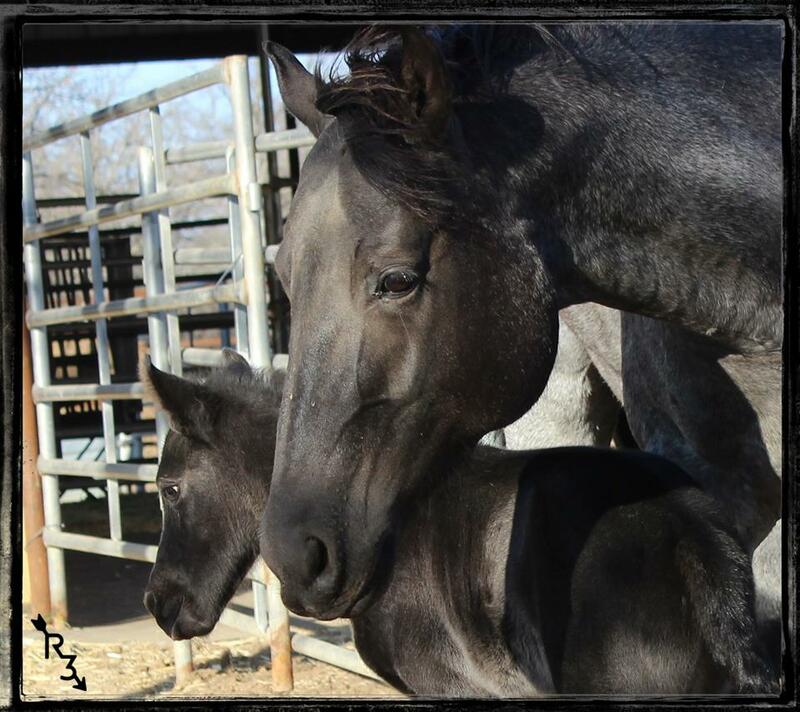 Here at Raisin Roans Ranch we like to raise a majority of our own brood mares so that we can get them young enough to have total influence over their nutrition and up bringing. 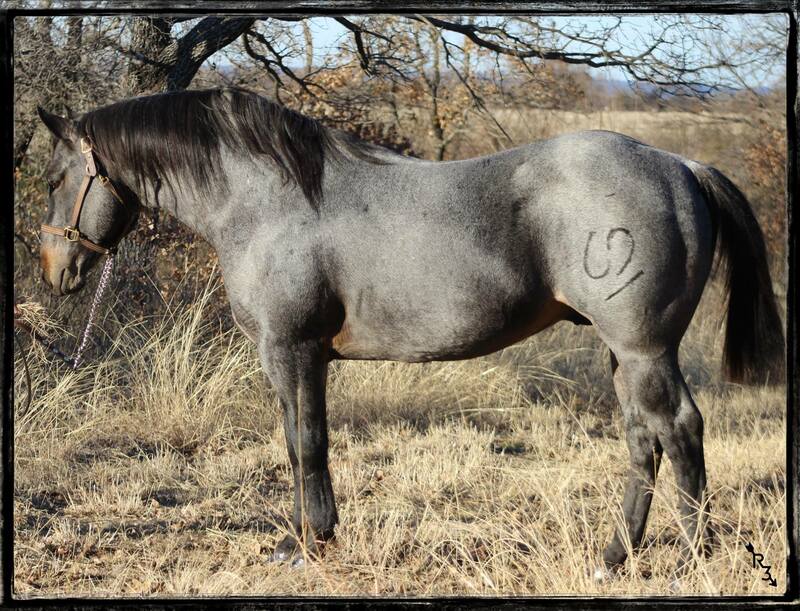 We pride ourselves in hand picking the best quality horses for our Blue Valentine/Joe Hancock breeding program. We believe the foundation of a great equine program starts with the dam! Our lines consist of a nice blend of pedigree's such as Dividend Coup, Plenty Try, Gooseberry, Rowdy Blue Man, Hancocks Blue Boy, Mr Roan Hancock, Salty Roan, Leo Hancock Hayes, Roan Ambrose, Blue Apache Hancock, Bonny Blues, Red Man and many more! 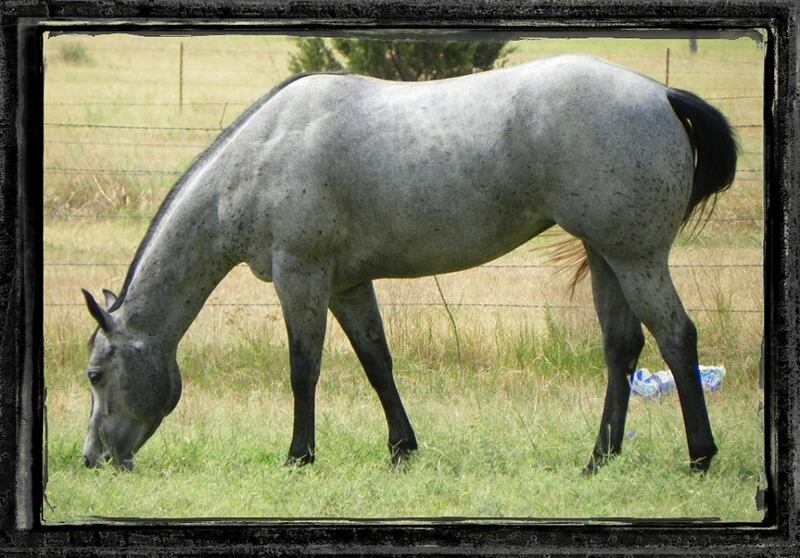 We have comprised a photo album of most the reference sires in our program, you may click the link to the left to view them. A High fat diet is what we use to grow our foals/weanlings to their fullest potential. Depending on what they need, we may use any one or combination of rice bran, black oiled sunflower seeds, coco soya and/or calf manna as a topper to their grain. We are pleased to have found a pellet feed that has no corn and low starch. 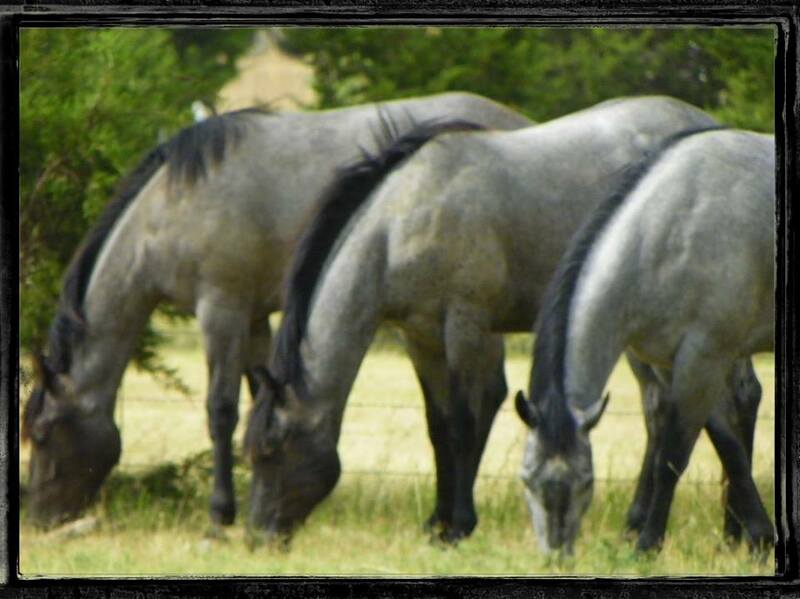 Our vet recommends that when growing foals they do not need any corn and very low starch, also to be very careful with providing to much protein. 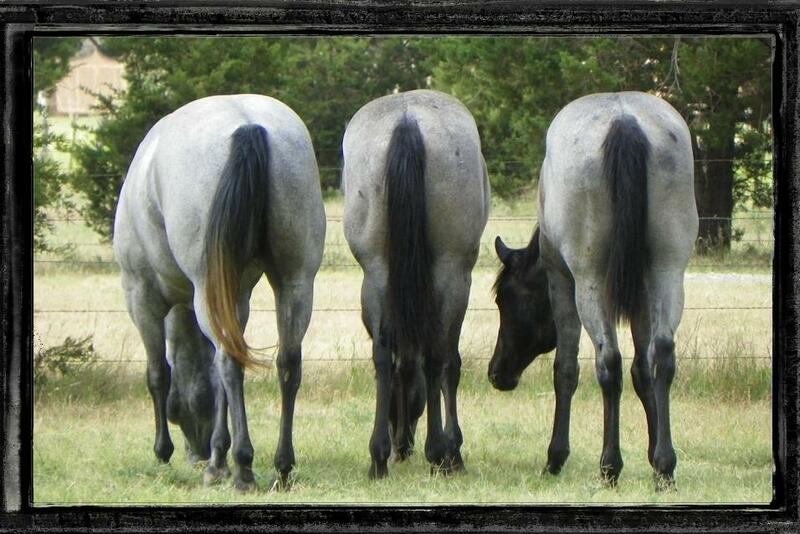 Since we also feed alfalfa, we highly monitor the protein in our foals and adjust as needed. About every month we worm alternating between different paste wormers. When they are old enough to go to their new homes, they will be halter broke as my husband, Tennessee and I will start them on Natural Horsemanship training. They will have been handled in the round pen, arena, pasture, etc... Also, we have our hands physically on them everyday. All of our stock is VERY gentle! 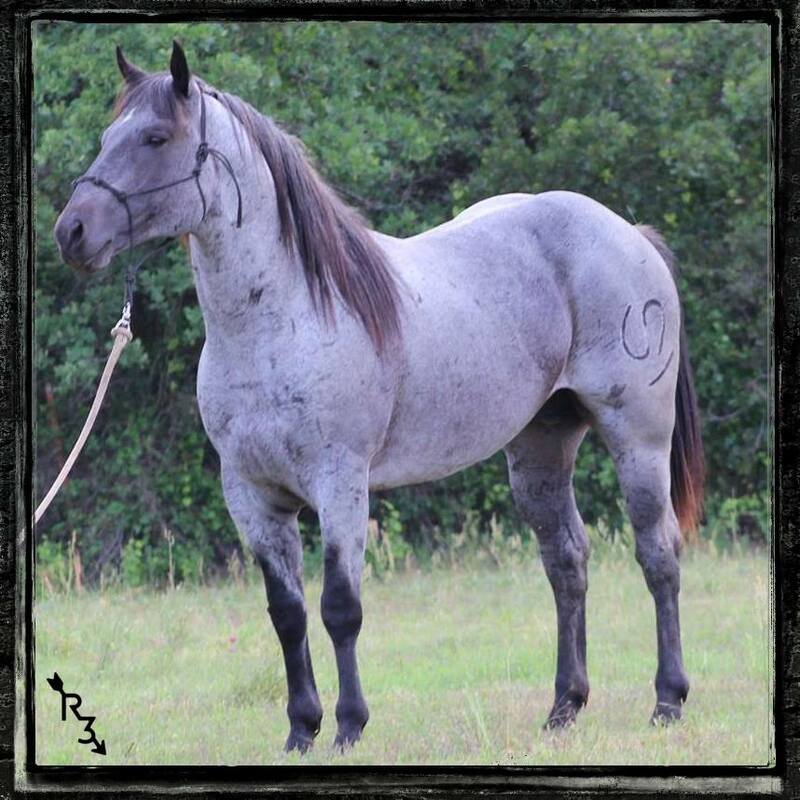 These foals will be started on the right road to make top competition, trail, team roping, sorting, team penning, ranch type work and life long partner horses. Picture taken in December of 2014 at age 5. Respect on the ground is so very important. 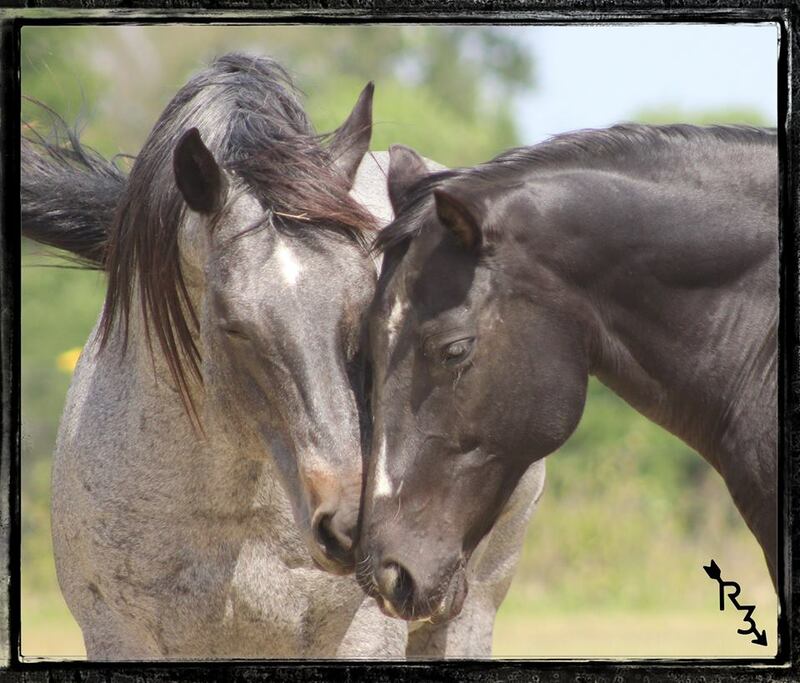 All of our horses go through a natural horsemanship program we comprised taking what we like from several well known trainers. 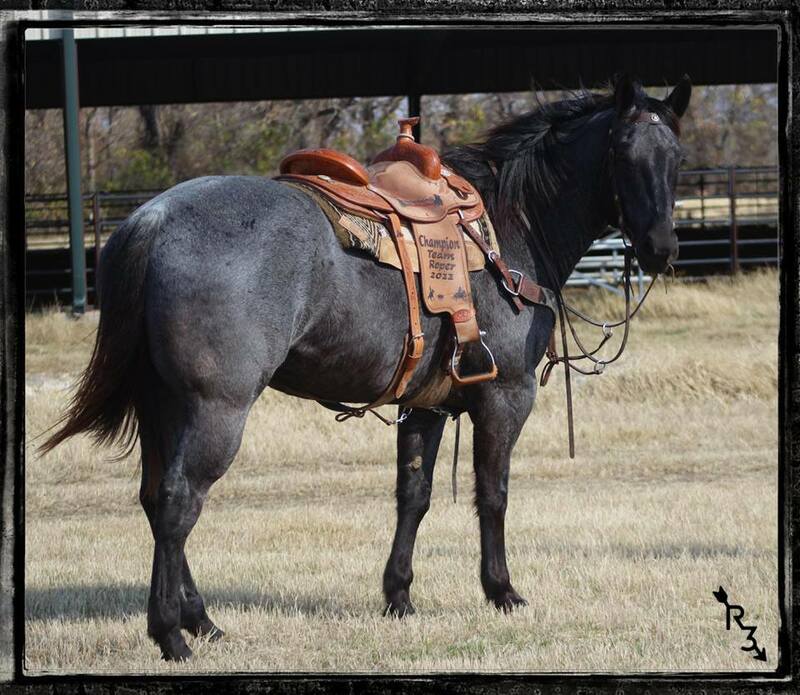 Raisin Roans Ranch believes it is VERY important to provide the best nutrition possible to get the maximum growth, conformation, muscle and bone development. 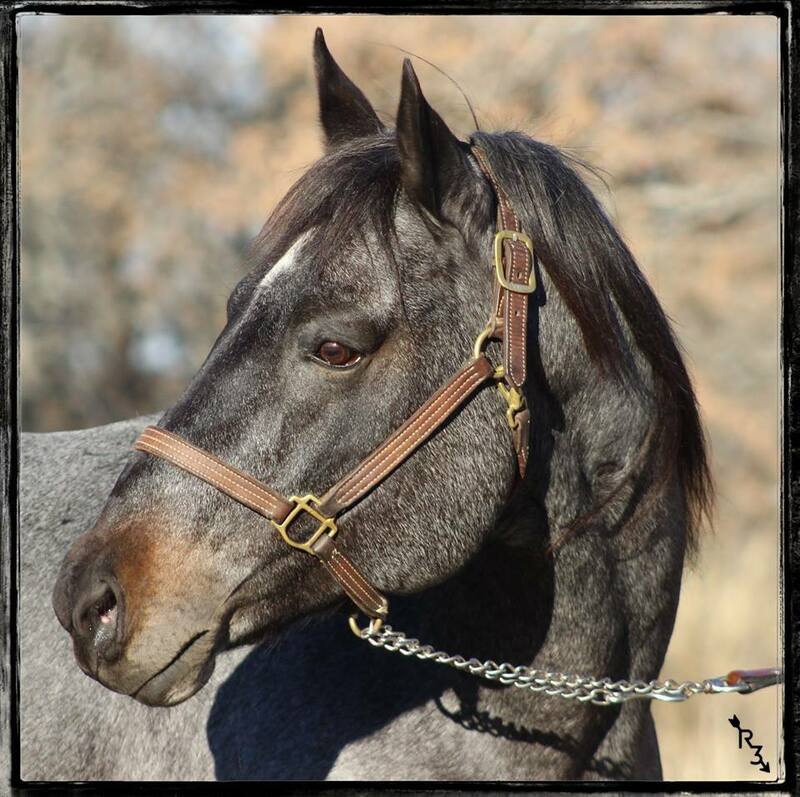 Nutrition along with breeding and a gentle touch with hands on natural horsemanship training provides us with awesome well rounded horses! Picture taken in the Summer of 2014 both at the age of 4. Picture taken in April of 2016, both at the age of 14. 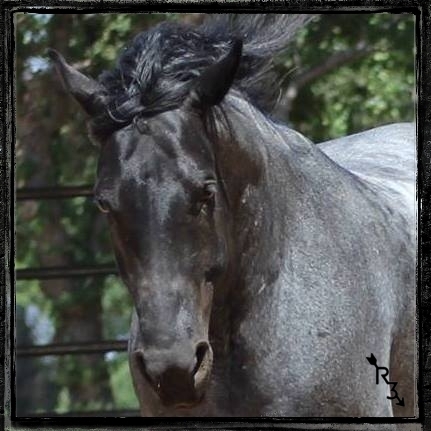 Ranch Horse Legacy. The Blue Valentine Story. Picture taken in the Summer of 2014 at age 4.